The construction of the Rockefeller Center complex in New York City was conceived as an urban renewal project in the late 1920s, spearheaded by John D. Rockefeller Jr. to help revitalize Midtown Manhattan. Rockefeller Center is located on one of Columbia University's former campuses and is bounded by Fifth Avenue to the east, Sixth Avenue (Avenue of the Americas) to the west, 48th Street to the south, and 51st Street to the north. The center occupies 22 acres (8.9 ha) in total, with some 17 million square feet (1.6 million square metres) of office space. Urban renewal is a program of land redevelopment in cities, often where there is urban decay. Urban renewal often refers to the clearing out of blighted areas in inner cities to clear out slums and create opportunities for higher class housing, businesses, and more. 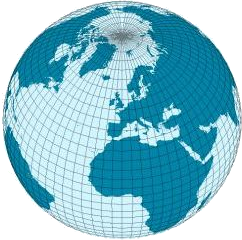 Modern attempts at renewal began in the late 19th century in developed nations, and experienced an intense phase in the late 1940s under the rubric of reconstruction. The process has had a major impact on many urban landscapes, and has played an important role in the history and demographics of cities around the world. John Davison Rockefeller Jr. was an American financier and philanthropist who was a prominent member of the Rockefeller family. He was the only son among the five children of Standard Oil co-founder John D. Rockefeller and the father of the five famous Rockefeller brothers. In biographies, he is commonly referred to as "Junior" to distinguish him from his father, "Senior". His sons included Nelson Rockefeller, the 41st Vice President of The United States; Winthrop Rockefeller, the 37th Governor of Arkansas; and banker David Rockefeller. Columbia University had acquired the site in the early 19th century but had moved to Morningside Heights in Upper Manhattan in the early 1900s. By the 1920s, Fifth Avenue in Midtown Manhattan was a prime site for development. 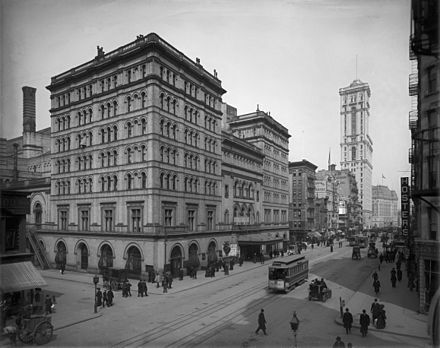 Around that time, the Metropolitan Opera (Met) was looking for a new site for their opera house, and architect Benjamin Wistar Morris decided on the former Columbia site. Morningside Heights is a neighborhood of the borough of Manhattan in New York City, on the border of the Upper West Side and Harlem. Morningside Heights is bounded by Morningside Park at Morningside Drive to the east, Manhattanville at 125th Street to the north, Manhattan Valley at 110th Street to the south, and Riverside Park at Riverside Drive to the west. The main thoroughfare is Broadway. Rockefeller eventually became involved in the project and leased the Columbia site in 1928 for 87 years. The lease excluded land along the east side of Sixth Avenue to the west of the Rockefeller property, as well as at the site's southeast corner. He hired Todd, Robertson, and Todd as design consultants and selected the architectural firms of Corbett, Harrison & MacMurray, Hood, Godley & Fouilhoux, and Reinhard & Hofmeister for the opera complex. However, the Met was unsure about moving there, and the Wall Street Crash of 1929 put an end to the plans. Rockefeller instead entered into negotiations with the Radio Corporation of America (RCA) to create a mass-media complex on the site. A new plan was released in January 1930, and an update to the plan was presented after Rockefeller obtained a lease for the land along Sixth Avenue. Revisions continued until March 1931, when the current site design was unveiled. A late change to the proposal included a complex of internationally themed structures along Fifth Avenue. All structures in the original complex were designed in the Art Deco architectural style. Excavation of the site started in April 1931, and construction began that September on the first buildings. The first edifice was opened in September 1932, and most of the complex was completed by 1935. The final three buildings were built between 1936 and 1940, although Rockefeller Center was officially completed by November 2, 1939. The construction project employed more than 40,000 people and was considered the largest private construction project at the time. It had cost the equivalent of $1.4 billion in 2016 dollars to construct. Since then, there have been several modifications to the complex. An additional building at 75 Rockefeller Plaza was constructed in 1947, while another at 600 Fifth Avenue was constructed in 1952. Four towers were built along the west side of Sixth Avenue in the 1960s and 1970s, which was the most recent expansion of Rockefeller Center. The Center Theatre from the original complex was demolished in 1954. 75 Rockefeller Plaza is a skyscraper in New York City, originally built as a northern extension to Rockefeller Center. The Center Theatre was a theater located at 1230 Sixth Avenue, the southeast corner of West 49th Street in Rockefeller Center in New York City. Seating 3,500, it was originally designed as a movie palace in 1932 and later achieved fame as a showcase for live musical ice-skating spectacles. It was demolished in 1954, the only building in the original Rockefeller Center complex to have been torn down. The Rockefeller Center originated as a plan to replace the old Metropolitan Opera Building (pictured). 30 Rockefeller Plaza (at right) was built around private property at its northwestern and southwestern corners. The Warby Parker store in the center of this image now occupies the site of the parcel at the northwestern corner of 30 Rockefeller Plaza. Construction progress in 1937, as seen from the east. Most of the original complex was completed, but a parking lot can be seen in the center left on the site of the future 10 Rockefeller Plaza, and the construction of 50 Rockefeller Plaza can be seen in the center right. The three buildings at 1211–1251 Avenue of the Americas were opened from 1971 through 1974. Radio City Music Hall is an entertainment venue at 1260 Avenue of the Americas, within Rockefeller Center, in Midtown Manhattan, New York City. Nicknamed the Showplace of the Nation, it is notable as the headquarters for the Rockettes, the precision dance company. Man at the Crossroads (1933) was a fresco by Diego Rivera in New York City's Rockefeller Center. It was originally slated to be installed in the lobby of 30 Rockefeller Plaza, the main building of the center. Man at the Crossroads showed the aspects of contemporary social and scientific culture. As originally installed, it was a three-paneled artwork. A central panel depicted a worker controlling machinery. The central panel was flanked by two other panels, The Frontier of Ethical Evolution and The Frontier of Material Development, which respectively represented socialism and capitalism. The Rainbow Room is a private event space on the 65th floor of 30 Rockefeller Plaza in Rockefeller Center, Midtown Manhattan, New York City. Run by Tishman Speyer, it is among the highest venues in New York City. The Rainbow Room serves classic and contemporary American cuisine. Fulton Center is a transit center and retail complex centered at the intersection of Fulton Street and Broadway in Lower Manhattan, New York City. The name also refers to the $1.4 billion project by the Metropolitan Transportation Authority (MTA), a public agency of the state of New York, to rehabilitate the New York City Subway's Fulton Street station. The work involved constructing new underground passageways and access points into the complex, renovating the constituent stations, and erecting a large station building that doubles as a part of the Westfield World Trade Center mall. Queens Plaza is an express station on the IND Queens Boulevard Line of the New York City Subway. Located under the eastern edge of Queens Plaza at the large Queens Plaza interchange, it is served by the E train at all times, by the R train at all times except late nights, and by the M train on weekdays except late nights. St. Nicholas Collegiate Reformed Protestant Dutch Church was a Reformed Protestant Dutch church in Midtown Manhattan, New York City that at the time of its demolition in 1949 was the oldest congregation in Manhattan. The church was located on the northwest corner of Fifth Avenue and 48th Street near Rockefeller Center. The church was built in 1872 to Gothic Revival designs in brownstone by architect W. Wheeler Smith and "distinguished by an elegantly tapered spire that, according to John A. Bradley in the New York Times, 'many declare…the most beautiful in this country.'" The congregation dated back to 1628. Prometheus is a 1934 gilded, cast bronze sculpture by Paul Manship, located above the lower plaza at Rockefeller Center in Manhattan, New York City. Created by Roman Bronze Works in Queens, the statue is 18 ft (5.5 m) tall and weighs 8 tons. Four Prometheus maquettes exist: one at the Smithsonian Institution, one at the Minnesota Museum of Art, and two in private collections. The British Empire Building, also known by its address 620 Fifth Avenue, is a 6-story retail building located on the west side of Fifth Avenue between 49th and 50th Streets in Midtown Manhattan, New York City. Completed in 1934, the structure is part of Rockefeller Center, and was built in the Art Deco style. La Maison Francaise, also known by its address 610 Fifth Avenue, is a 6-story retail building located on the west side of Fifth Avenue between 49th and 50th Streets in Midtown Manhattan, New York City. Completed in 1934, the structure is part of Rockefeller Center, and was built in the Art Deco style. 1 Rockefeller Plaza is a 36-story building located on the east side of Rockefeller Plaza between 48th and 49th Streets in Midtown Manhattan, New York City. Completed in 1937, the tower is part of Rockefeller Center, which was built in the Art Deco style. 50 Rockefeller Plaza is a 15-story building located at Rockefeller Plaza between 50th and 51st Streets in Midtown Manhattan, New York City. Completed in 1938, the building is part of Rockefeller Center, which was built in the Art Deco style. 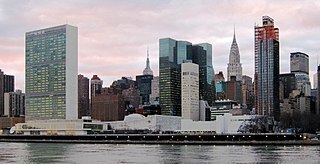 The International Building, also known by its addresses 630 Fifth Avenue and 45 Rockefeller Plaza, is a 512-foot (156 m), 41-story building located on the west side of Fifth Avenue between 50th and 51st Streets in Midtown Manhattan, New York City. Completed in 1935, the tower is part of Rockefeller Center, and was built in the Art Deco style. The International Building is set back from Fifth Avenue, with a plaza in front of the main entrance. Two retail wings, the Palazzo d'Italia and International Building North, surround the plaza to the south and north, respectively. The building contains several works of art as part of its design, including the Atlas statue in the plaza. 1 2 3 4 Balfour 1978, p. 7. 1 2 Okrent 2003, p. 7. 1 2 3 Federal Reserve Bank of Minneapolis Community Development Project. "Consumer Price Index (estimate) 1800–". Federal Reserve Bank of Minneapolis. Retrieved January 2, 2019. ↑ Bolton, H.C. (October 1897). "Early American Chemical Societies". Appleton's Popular Science Monthly. 51: 822. Retrieved June 8, 2010. 1 2 3 "Rockefeller Buys $100,000,000 Realty" (PDF). The New York Times. December 28, 1928. ISSN 0362-4331 . Retrieved November 10, 2017. ↑ Fitch & Waite 1974, p. 8. 1 2 Adams 1985, p. 12. 1 2 3 4 5 6 7 Fitch & Waite 1974, p. 9. 1 2 Okrent 2003, p. 8. 1 2 3 4 5 Balfour 1978, p. 8. ↑ Okrent 2003, p. 9. 1 2 3 Glancy 1992, p. 427. 1 2 Okrent 2003, pp. 11–12. 1 2 3 4 5 6 7 8 9 10 11 12 13 14 Thomas, Ryland; Williamson, Samuel H. (2018). "What Was the U.S. GDP Then?". MeasuringWorth. Retrieved January 5, 2018. United States Gross Domestic Product deflator figures follow the Measuring Worth series. 1 2 3 4 Fitch & Waite 1974, p. 10. ↑ Okrent 2003, p. 13. 1 2 3 4 Balfour 1978, p. 4. ↑ Okrent 2003, p. 26. 1 2 Radio City Music Hall Landmark Designation 1978, p. 3. 1 2 Okrent 2003, p. 21. ↑ Balfour 1978, p. 3. ↑ Okrent 2003, p. 17. ↑ Phillips-Matz 1984, p. 97. ↑ Okrent 2003, pp. 19–20. ↑ Phillips-Matz 1984, p. 100. ↑ Balfour 1978, pp. 4, 6. ↑ Okrent 2003, pp. 26–27. ↑ Okrent 2003, p. 28. ↑ Balfour 1978, p. 6. ↑ Okrent 2003, p. 29. 1 2 Adams 1985, p. 13. ↑ Balfour 1978, pp. 6–7. ↑ Krinsky 1978, pp. 30–31. ↑ Krinsky 1978, pp. 31–32. 1 2 3 4 Balfour 1978, p. 12. 1 2 3 4 Jackson 2010, p. 1115. ↑ Krinsky 1978, p. 33. ↑ Okrent 2003, p. 64. ↑ Krinsky 1978, p. 32. 1 2 Balfour 1978, p. 15. 1 2 3 4 5 6 7 8 9 10 11 Fitch & Waite 1974, p. 11. 1 2 3 Balfour 1978, p. 9. 1 2 Okrent 2003, p. 47. ↑ Okrent 2003, p. 49. 1 2 Krinsky 1978, p. 35. 1 2 3 4 5 6 "Rockefeller Site For Opera Dropped" (PDF). The New York Times. December 6, 1929. ISSN 0362-4331 . Retrieved November 10, 2017. 1 2 3 Okrent 2003, p. 83. ↑ Okrent 2003, p. 53. 1 2 3 Seielstad 1930, p. 19. ↑ Kaiser, Charles (March 21, 1976). "The Truth Is, Columbia Owns Rockefeller Center Buildings, Too" . The New York Times. ISSN 0362-4331 . Retrieved April 6, 2018. ↑ Dowd, Maureen (February 6, 1985). "Columbia Is To Get $400 Million In Rockefeller Center Land Sale" . The New York Times. ISSN 0362-4331 . Retrieved April 6, 2018. ↑ Okrent 2003, p. 54. 1 2 "Engineers Engaged For Opera Centre" (PDF). The New York Times. October 5, 1929. ISSN 0362-4331 . Retrieved November 10, 2017. 1 2 Krinsky 1978, p. 36. 1 2 Okrent 2003, pp. 101–102. 1 2 3 4 5 6 7 National Park Service (November 2, 2013). "National Register Information System – Rockefeller Center (#87002591)". National Register of Historic Places . National Park Service. Retrieved April 14, 2018. 1 2 Radio City Music Hall Landmark Designation 1978, p. 6. ↑ Krinsky 1978, p. 38. 1 2 Balfour 1978, p. 16. ↑ Okrent 2003, pp. 102–103. ↑ Okrent 2003, p. 103. 1 2 Okrent 2003, p. 104. ↑ Okrent 2003, p. 132. ↑ Balfour 1978, p. 14. ↑ Federal Writers' Project 1939, p. 334. 1 2 3 4 5 6 Fitch & Waite 1974, p. 12. 1 2 Krinsky 1978, p. 44. 1 2 3 Balfour 1978, p. 29. 1 2 Balfour 1978, p. 30. ↑ Goldberger, Paul (December 3, 1981). "Wallace Harrison Dead At 86" . The New York Times. ISSN 0362-4331 . Retrieved November 16, 2017. ↑ Balfour 1978, p. 28. ↑ Okrent 2003, p. 107. ↑ Balfour 1978, p. 27. ↑ Okrent 2003, p. 58. ↑ Okrent 2003, p. 109. ↑ Adams 1985, p. 253. 1 2 Balfour 1978, pp. 10–11. ↑ Balfour 1978, pp. 9–10. ↑ Krinsky 1978, pp. 48–49. ↑ Krinsky 1978, p. 49. ↑ Okrent 2003, p. 88. ↑ Krinsky 1978, pp. 42–43. ↑ Glancy 1992, p. 431, footnote 48. 1 2 Balfour 1978, p. 17. 1 2 3 Krinsky 1978, p. 33, map p. 34. ↑ "$3,600,000 Price Put On New Opera Site" (PDF). The New York Times. January 29, 1929. ISSN 0362-4331 . Retrieved November 16, 2017. 1 2 Okrent 2003, p. 68. ↑ Krinsky 1978, pp. 16, 49–50. 1 2 Balfour 1978, p. 11. ↑ Krinsky 1978, p. 48. 1 2 Krinsky 1978, p. 50. ↑ Adams 1985, p. 29. 1 2 Balfour 1978, p. 20. ↑ Okrent 2003, pp. 134–135. ↑ Okrent 2003, pp. 135–136. 1 2 Balfour 1978, p. 23. ↑ Okrent 2003, p. 70. ↑ Okrent 2003, pp. 137–138. 1 2 Okrent 2003, p. 142. 1 2 3 Balfour 1978, p. 53. ↑ Krinsky 1978, pp. 50, 52, map p. 51. ↑ Krinsky 1978, pp. 52–53. ↑ "Radio City Work Begins in Spring" (PDF). New York Sun. January 10, 1931. Retrieved November 10, 2017– via Fultonhistory.com. ↑ Balfour 1978, pp. 17–18. ↑ Balfour 1978, p. 35. 1 2 Krinsky 1978, p. 53. ↑ "Large Leases Filed On Radio City Land" (PDF). The New York Times. September 15, 1931. ISSN 0362-4331 . Retrieved November 16, 2017. ↑ "New Theatre Seeks Rockefeller Site" (PDF). The New York Times. February 15, 1930. ISSN 0362-4331 . Retrieved November 10, 2017. ↑ Krinsky 1978, pp. 53, map p. 54. 1 2 3 4 "Rockefeller Begins Work in the Fall on 5th Av. Radio City" (PDF). The New York Times. June 17, 1930. ISSN 0362-4331 . Retrieved November 10, 2017. ↑ Okrent 2003, p. 161. ↑ Krinsky 1978, pp. 55, map p. 54. 1 2 Krinsky 1978, p. 55. 1 2 "Rockefeller Plans Huge Culture Centre" (PDF). The New York Times. June 14, 1930. ISSN 0362-4331 . Retrieved November 15, 2017. 1 2 3 4 Adams 1985, p. 45. ↑ Balfour 1978, p. 21. ↑ Okrent 2003, p. 143. ↑ Okrent 2003, pp. 170–171. 1 2 Krinsky 1978, p. 56. 1 2 Okrent 2003, p. 174. 1 2 3 Krinsky 1978, p. 57. ↑ Krinsky 1978, pp. 16–17. ↑ Kayden & Municipal Art Society 2000, p. 8. ↑ Kayden & Municipal Art Society 2000, pp. 11–12. ↑ Balfour 1978, p. 39. ↑ Tauranac 2014, p. 83. ↑ Okrent 2003, p. 256. ↑ Krinsky 1978, p. 17. 1 2 Krinsky 1978, pp. 76–77. ↑ Okrent 2003, pp. 256–257. 1 2 Okrent 2003, pp. 160–161. ↑ Okrent 2003, pp. 161–162. ↑ Balfour 1978, p. 38. 1 2 3 4 Okrent 2003, p. 177. ↑ Popular Mechanics 1932, pp. 252–253. 1 2 3 "Radio City to Create a New Architecture" (PDF). The New York Times. March 6, 1931. ISSN 0362-4331 . Retrieved November 11, 2017. 1 2 3 4 5 "Many Realty Interests Seen in Metropolitan Area" (PDF). The New York Times. October 4, 1931. ISSN 0362-4331 . Retrieved November 11, 2017. ↑ "Opera House Included in Radio City Plans" (PDF). The New York Times. March 2, 1931. ISSN 0362-4331 . Retrieved November 11, 2017. 1 2 "Babylonian Gardens To Blossom 60 Stories Above Street In 'Radio City'" (PDF). Yonkers Statesman. August 20, 1931. p. 11. Retrieved November 11, 2017– via Fultonhistory.com. 1 2 "Radio City to Have Pastel Wall Hues" (PDF). The New York Times. September 29, 1931. ISSN 0362-4331 . Retrieved November 11, 2017. ↑ Krinsky 1978, pp. 57–58. 1 2 3 Balfour 1978, p. 36. ↑ Okrent 2003, pp. 180–182. ↑ "Radio City, Revised" (PDF). The New York Times. April 3, 1931. ISSN 0362-4331 . Retrieved December 4, 2017. ↑ Okrent 2003, p. 182. 1 2 3 4 Adams 1985, p. 92. 1 2 3 Krinsky 1978, p. 59. 1 2 Balfour 1978, p. 44. ↑ Krinsky 1978, pp. 62–63. ↑ Weisman 1959, p. 56. 1 2 3 "Plans Revised For Radio City" (PDF). The New York Sun. August 24, 1931. p. 20. Retrieved November 16, 2017– via Fultonhistory.com. ↑ "Rockefeller City to Have Big Plaza" (PDF). The New York Times. June 10, 1932. ISSN 0362-4331 . Retrieved November 11, 2017. 1 2 3 4 Krinsky 1978, p. 64. 1 2 3 4 Weisman 1959, p. 57. 1 2 "Statue in Center Plaza" (PDF). The New York Times. January 10, 1934. ISSN 0362-4331 . Retrieved November 11, 2017. 1 2 Hood, Raymond (August 23, 1931). "The Babylonian Dream Soon to Be Made Reality in Radio City Is Seen by the Architects as a Huge Experiment Holding the Possibility of a Completely Transformed Metropolis" (PDF). The New York Times. ISSN 0362-4331 . Retrieved November 11, 2017. 1 2 Okrent 2003, p. 183. 1 2 3 Krinsky 1978, p. 61. ↑ Balfour 1978, pp. 49–50. ↑ "Rockefeller Centre To Have Roof Bridges" (PDF). The New York Times. March 19, 1932. ISSN 0362-4331 . Retrieved November 11, 2017. ↑ Balfour 1978, p. 51. ↑ Krinsky 1978, p. 62. ↑ Balfour 1978, p. 47. 1 2 Balfour 1978, p. 52. 1 2 Adams 1985, p. 87. ↑ International Building Landmark Designation 1985, p. 8. 1 2 3 4 Krinsky 1978, p. 69. ↑ Okrent 2003, p. 275. ↑ "Radio City Building Seen As Aid To Britain" (PDF). The New York Times. January 8, 1932. ISSN 0362-4331 . Retrieved November 11, 2017. ↑ "Rockefeller City Adds French Unit" (PDF). The New York Times. March 31, 1932. ISSN 0362-4331 . Retrieved November 11, 2017. ↑ Adams 1985, p. 124. ↑ Balfour 1978, p. 46. ↑ "Rockefeller City Alters Plans Again" (PDF). The New York Times. June 1, 1932. ISSN 0362-4331 . Retrieved November 12, 2017. ↑ "Change in Plans for the New Rockefeller Center" (PDF). Buffalo Evening News. June 1, 1932. p. 34. Retrieved November 10, 2017– via Fultonhistory.com. ↑ Okrent 2003, p. 203. 1 2 3 4 Balfour 1978, p. 91. 1 2 3 Okrent 2003, p. 213. 1 2 Krinsky 1978, p. 65. ↑ Adams 1985, p. 46. ↑ Balfour 1978, p. 92. 1 2 Gilligan, Edmund (November 29, 1932). "Roxy Presents New Mood" (PDF). The New York Sun. p. 20. Retrieved November 11, 2017– via Fultonhistory.com. ↑ Brock, H.I. (April 5, 1931). "Problems Confronting The Designers Of Radio" (PDF). The New York Times. ISSN 0362-4331 . Retrieved November 28, 2017. ↑ "Broad Promenade To Flank New Opera" (PDF). The New York Times. July 16, 1932. ISSN 0362-4331 . Retrieved November 16, 2017. ↑ "Radio City Leaders Plan Foreign Tour" (PDF). The New York Times. September 11, 1931. ISSN 0362-4331 . Retrieved November 25, 2017. ↑ Balfour 1978, p. 93. ↑ Okrent 2003, p. 214. ↑ Krinsky 1978, p. 66. ↑ Okrent 2003, p. 215. ↑ Radio City Music Hall Landmark Designation 1978, p. 7. ↑ Okrent 2003, pp. 216–218. ↑ Radio City Music Hall Landmark Designation 1978, p. 10. ↑ Okrent 2003, pp. 218–220. ↑ Radio City Music Hall Landmark Designation 1978, p. 1. 1 2 Okrent 2003, p. 222. ↑ "Radio City To Build Tunnels For Public" (PDF). The New York Times. December 4, 1931. ISSN 0362-4331 . Retrieved November 15, 2017. ↑ "Underground Traffic Planned" (PDF). New York Sun. October 6, 1933. p. 20. Retrieved November 10, 2017– via Fultonhistory.com. 1 2 3 "Rockefeller City Gets A Huge Ramp" (PDF). The New York Times. May 22, 1934. ISSN 0362-4331 . Retrieved November 11, 2017. 1 2 3 4 5 6 7 8 Okrent 2003, p. 337. ↑ "New Avenue From 42nd to 59th St. Urged To Cut Through Radio City on Three Levels" (PDF). The New York Times. May 8, 1931. ISSN 0362-4331 . Retrieved November 11, 2017. ↑ "A New Avenue Proposed By Mayor Gaynor" (PDF). The New York Times. May 29, 1910. ISSN 0362-4331 . Retrieved November 11, 2017. 1 2 Adams 1985, p. 177. ↑ Okrent 2003, p. 289. 1 2 Krinsky 1978, p. 110. 1 2 Adams 1985, p. 21. 1 2 3 "Outline Is Drawn Of Radio City Art" (PDF). The New York Times. December 6, 1931. ISSN 0362-4331 . Retrieved November 11, 2017. 1 2 3 Balfour 1978, p. 137. 1 2 Roussel 2006, p. 6. 1 2 Nash & McGrath 1999, p. 93. ↑ Okrent 2003, pp. 184–185. ↑ Okrent 2003, p. 185. ↑ Adams 1985, p. 22. ↑ Balfour 1978, p. 139. ↑ Okrent 2003, p. 290. 1 2 Okrent 2003, p. 291. ↑ Blaszczyk 2002, p. 136. ↑ Adams 1985, p. 259. ↑ Okrent 2003, pp. 292–293. ↑ Okrent 2003, p. 293. ↑ Adams 1985, p. 254. ↑ Adams 1985, p. 257. ↑ Okrent 2003, p. 298. 1 2 Adams 1985, p. 260. ↑ Okrent 2003, p. 294. ↑ Okrent 2003, p. 218. ↑ Balfour 1978, p. 141. ↑ Smith 2014, pp. 91–92. ↑ Okrent 2003, p. 302. 1 2 Smith 2014, p. 97. ↑ Okrent 2003, p. 304. ↑ Okrent 2003, p. 312. ↑ Okrent 2003, p. 313. ↑ "Rivera RCA Mural Is Cut From Wall" (PDF). The New York Times. February 13, 1934. ISSN 0362-4331 . Retrieved November 11, 2017. ↑ Okrent 2003, p. 319. ↑ Okrent 2003, pp. 318, 329. 1 2 Okrent 2003, p. 300. ↑ "Four-Ton Glass Panel Glorifying Worker To Decorate Rockefeller Center Building" (PDF). The New York Times. July 3, 1935. ISSN 0362-4331 . Retrieved November 21, 2017. 1 2 Okrent 2003, p. 299. ↑ "Italian Building Here is Altered" . The New York Times. December 13, 1941. p. 8. ISSN 0362-4331 . Retrieved November 20, 2017. ↑ Adams 1985, p. 120. ↑ Balfour 1978, p. 149. ↑ Adams 1985, p. 130. 1 2 "Radio City to Bear the Name of Rockefeller" (PDF). The New York Times. December 21, 1931. ISSN 0362-4331 . Retrieved November 11, 2017. ↑ Okrent 2003, p. 258. ↑ Okrent 2003, pp. 258–259. ↑ Miller, Moscrip (1937). "Mystery on Sixth Ave" (PDF). Screen & Radio Weekly. Retrieved November 10, 2017– via Fultonhistory.com. ↑ Okrent 2003, pp. 189–190. ↑ Okrent 2003, p. 189. 1 2 3 Okrent 2003, p. 191. ↑ Okrent 2003, p. 390. ↑ Roussel 2006, p. 11. ↑ Krinsky 1978, p. 11. 1 2 3 Glancy 1992, p. 428. ↑ Okrent 2003, pp. 86–87. ↑ Okrent 2003, pp. 85–86. ↑ Okrent 2003, pp. 87–88. ↑ "Radio City Hold-Out Won By Two Icemen" (PDF). The New York Times. August 21, 1931. ISSN 0362-4331 . Retrieved November 11, 2017. 1 2 Okrent 2003, pp. 88–89. 1 2 Alpern & Durst 1996, p. 37. ↑ Okrent 2003, pp. 90–93, map p. 92. 1 2 Okrent 2003, p. 94, map p. 92. 1 2 Okrent 2003, p. 338. ↑ Alpern & Durst 1996, p. 38. 1 2 3 Okrent 2003, pp. 93–94, map p. 92. 1 2 Alpern & Durst 1996, pp. 38, 40. ↑ Okrent 2003, p. 94. 1 2 Okrent 2003, p. 339. ↑ Okrent 2003, p. 98. ↑ Okrent 2003, p. 97. ↑ "Church Won't Sell Site To Rockefeller" (PDF). The New York Times. 1929. ISSN 0362-4331 . Retrieved November 22, 2017. ↑ "'Radio City' Digging to Begin Tomorrow" (PDF). The New York Times. July 26, 1931. ISSN 0362-4331 . Retrieved November 11, 2017. ↑ Okrent 2003, p. 187. ↑ Okrent 2003, p. 193. ↑ Okrent 2003, pp. 194–195. ↑ "$7,000,000 Building Begun In Radio City" (PDF). The New York Times. August 12, 1931. ISSN 0362-4331 . Retrieved November 11, 2017. ↑ Okrent 2003, p. 192. ↑ "Radio City Towers To Be Of Limestone" (PDF). The New York Times. December 24, 1931. ISSN 0362-4331 . Retrieved November 11, 2017. ↑ "Biggest Steel Order Given For Radio City" (PDF). The New York Times. March 19, 1931. ISSN 0362-4331 . Retrieved November 25, 2017. 1 2 Okrent 2003, p. 197. ↑ Okrent 2003, p. 198. ↑ Okrent 2003, pp. 198–199. ↑ Okrent 2003, pp. 251–252. ↑ "First Steel Column Erected in 70-Story Rockefeller Unit" . The New York Times. March 8, 1932. p. 43. ISSN 0362-4331 . Retrieved November 15, 2017. ↑ Okrent 2003, pp. 275–276. ↑ "British Lay Stone In Rockefeller City" (PDF). The New York Times. July 3, 1932. ISSN 0362-4331 . Retrieved November 12, 2017. ↑ "Nobleman Lays Cornerstone in Radio City". Brooklyn Daily Eagle. July 3, 1932. p. 6. Retrieved November 10, 2017– via Newspapers.com. ↑ "Rockefeller Centre Employs 5,000 Men" (PDF). The New York Times. September 16, 1932. ISSN 0362-4331 . Retrieved November 12, 2017. ↑ "Nelson Rockefeller To Address Skyscraper Workers Tomorrow" (PDF). Tarrytown Daily News. September 19, 1932. p. 16. Retrieved November 10, 2017– via Fultonhistory.com. ↑ "British Unit is Begun at Rockefeller Centre" (PDF). The New York Times. October 19, 1932. ISSN 0362-4331 . Retrieved November 14, 2017. ↑ "Mount Vernon Shares Glory At Opening Of Radio City Music Hall In New York" (PDF). Daily Argus. Mount Vernon, New York. December 28, 1932. p. 16. Retrieved November 10, 2017– via Fultonhistory.com. ↑ "Music Hall Marks New Era In Design" (PDF). The New York Times. December 28, 1932. ISSN 0362-4331 . Retrieved November 12, 2017. ↑ Okrent 2003, p. 239. ↑ "Facade 'Topped Out' In Rockefeller Unit" (PDF). The New York Times. August 11, 1932. ISSN 0362-4331 . Retrieved November 14, 2017. 1 2 Balfour 1978, p. 94. ↑ Okrent 2003, p. 244. 1 2 Adams 1985, pp. 51–52. 1 2 Krinsky 1978, p.